It’s hard to believe that a growing number of gamers are coming to age without the opportunity to play a Klonoa game. We are becoming grittier and grittier in our gaming aesthetics and kids are growing up with the urge to violently blow off another person’s head, meaning that Klonoa’s cute design and whimsical mechanics of inflating goofy enemies are no longer appealing to the children, or anyone with a soul, like it used to be. His most recent game was a remake on the Wii, but the poor sales all but killed his return to the video game scene. The massive backlash against his potentially awful redesign indicates he has a very vocal fanbase, myself among them, but sadly, that number is also very small. 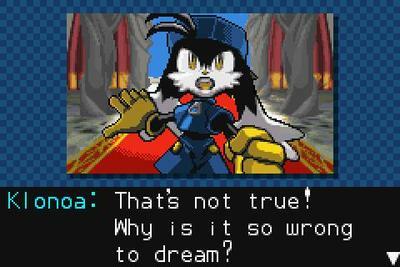 It is very likely that we will never see a new Klonoa game ever again. A very sad situation indeed. Despite this, Bandai Namco has done a decent job of keeping his legacy and games alive through re-releasing his classic games on today’s digital scene, appealing to the adults who played his games during their youth and hopefully a new audience of their children. 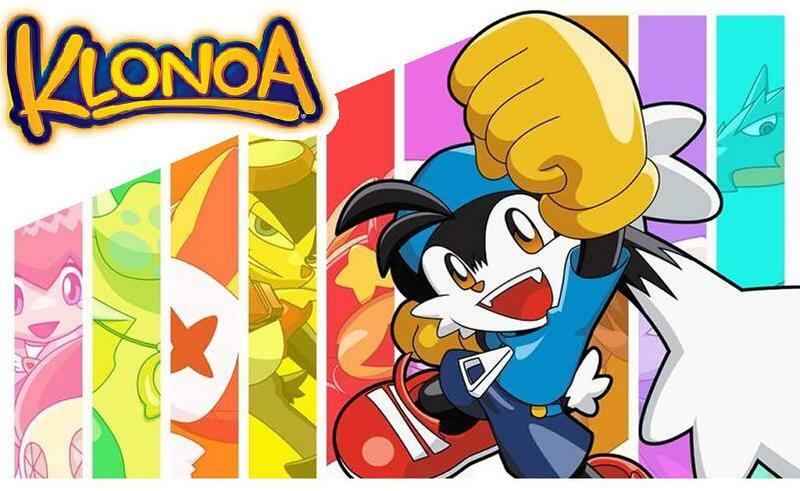 The original game, Klonoa: Door to Phantomile, has been available for quite some time on the PlayStation Store and has an especially nice home where it shines brilliantly on the PS Vita. It’s hard to find a better platformer pairing than Klonoa and Tomba. The company hasn’t gotten around to releasing his PlayStation 2 Classic, Klonoa 2: Lunatea’s Veil, on the PlayStation Network just yet, but this week sees the release of his Game Boy Advance game, Klonoa: Empire of Dreams, on the Wii U Virtual Console, and it is a game you should dedicate a solid chunk of time to. To understand the appeal of Klonoa, you really have to go back to the first game, Door to Phantomile. Back in the days of Super Mario 64 and the 3D revolution, Bandai Namco decided to go against the trends of the market and stick to the tried and true classic 2D platforming. Using the original PlayStation’s technology, Door to Phantomile used hand-drawn sprites sprawled against a 3D background. Viewtiful Joe, the aforementioned Tomba!, Pandemonium, and a handful of other under the radar games appear in this same genre, but may have gone under-appreciated for many year thanks to them being overshadowed the the 3D greats of the time, Tomb Raider, Ocarina of Time, Soul Reaver, etc. Simple gameplay aside, Door to Phantomile is also just straight up adorable and worthy to revisit for the whimsical atmosphere and the heart-grabbing ending which will provide you one of gaming’s few genuine opportunities to cry. Fast forward four years, two months after his PlayStation 2 sequel expanded on the original formula. 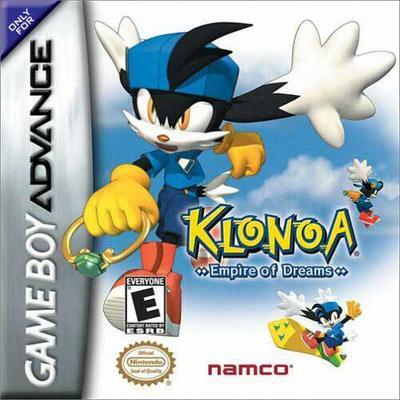 Bandai Namco also released Klonoa: Empire of Dreams on the Game Boy Advance. The rotating camera was no longer an option thanks to Game Boy Advance’s technological shortcomings, but Bandai Namco found a way to compensate for this by recreating Klonoa: Empire of Dreams as an entirely different style of puzzle platformer. With nearly the tightest possible controls and nearly a hundred puzzles, each more complex and challenging than the last, Bandai Namco once again found a way for Klonoa to thrive without the need to be a boundary pushing figure in the gaming industry. The game doesn’t revolutionize the puzzle platformer or bring any new technology to the forefront, it merely perfects what is available and brings along all of Klonoa‘s distinctive charm. It’s also really hard. In fact, creator Hideo Yoshizawa admits that some of the bonus puzzles might be a little “too challenging.” I can agree because I beat the standard game back in the day, but was never able to complete these ridiculous extra stages. Maybe the time has come to do so again. Fast forward once again to today. Where are all the 3D platforming games? They aren’t quite in style anymore, and 2D has once again been given a chance to thrive thanks to the dedicated indie scene and the simple development and distribution on the PC, Android, and iOS market. Naturally, this also means Klonoa should be much more fitting to the times rather than when he debuted as a relic clinging to the olden days. His style of platforming, both his classic “2.5D” platformers and his puzzle platformers, are far more in fashion than they were in the mid 1990s, and I can’t think of any character who deserves more of a second chance using solely the mechanics which made him popular the first time around. If you are a fan of puzzle platformers like Braid, Goat Escape, and pretty much every 2D platforming game to emerge since the indie movement, you owe it to yourself to check out Klonoa: Empire of Dreams. Its story doesn’t nearly hit the emotional levels that its console brothers do, but the purpose of this game is puzzle solving, not grand adventure. This is clearly a game that influenced a lot of today’s brightest indie developers. Let’s not forget that the Game Boy Advance Virtual Console for the Wii U has an unusual level of quality thanks to the gurus at M2, and Klonoa’s fluid Game Boy Advance sprite is bound to look better than it did on the small, cramped, and dull Game Boy Advance screen. At $7.99, this should be an obvious buy for the Wii U, especially if you are running a little shy on games to play these days. And if you like it, be sure to check Klonoa on the Wii. The physical game should be dirt cheap, especially for one of the best games on the platform. When played alongside Empire of Dreams, you can get a solid understanding about what this series is about. PlayStation 3 or PS Vita owners should drop everything and buy Door to Phantomile as well, because it is one of the biggest steals on PSN for just $5.99. If you enjoy it, join me in praying for the re-release of Klonoa 2: Lunatea’s Veil. We all could use a little more Klonoa in our lives, and the time is perfect to re-embrace one of gaming’s most adorable and secretly important platforming figures.